A 12 year-old boy fell at home against the wall where a fishhook was hanging. 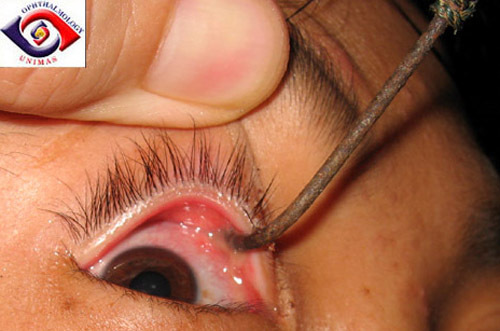 The fishhook entered the right upper eyelid (Figure 1) through the upper fornix (Figure 2). The local doctor attempted retrograde removal ie. removing the eyelid through its original track but without success. He was given tetanus injection and referred to our eye department. Examination showed normal vision in both eyes measuring 6/6 and the ocular movement was full which excluded extraocular muscles involvement (Figure 3). The X-rays showed the possibility of frontal sinus penetration by the point of the fish hook (Figure 4) and a CT scan was ordered to better localize the position of the point. 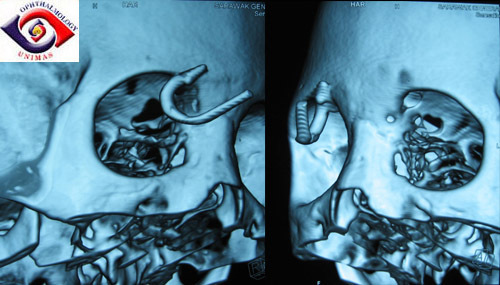 The reconstructed CT scans showed the point of the fishhook was extracranial and spare the frontal sinus (Figure 5). Figure 1. 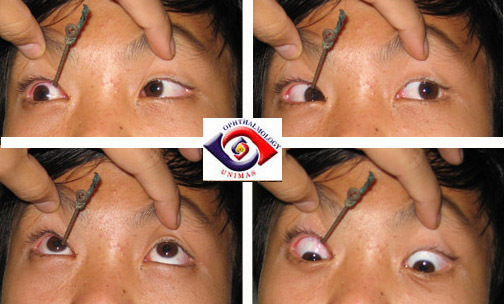 Right upper eyelid fishhook penetration. Figure 2. Fishhook enter the eyelid through the superotemporal fornix. Figure 3. Normal ocular movement. Figure 4. 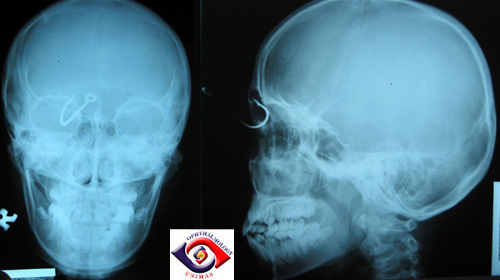 Plain X-rays of the skull show the tip of the fishhook may be in the frontal sinus. a. Why can't the hook be removed by the retrograde method? b. How may the fishhook be removed?